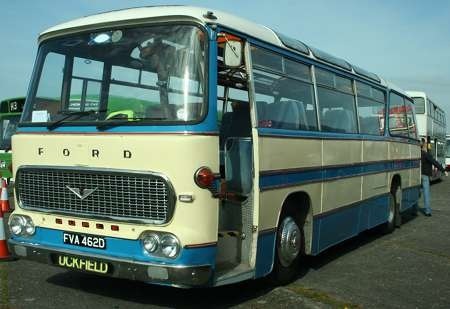 FVA 462D a Ford R192 with Duple C45F body, it was new to Hutchison of Overtown in 1966. She’s seen at the Wisley Rally on 5 April 2009, but I’ve never (knowingly) seen a vehicle in Hutchison livery. Is this the original livery of Hutchisons? Photograph and Copy contributed by Pete Davies. Hutchison’s livery was a rather striking two-tone blue (without any cream/white relief). Could the "Uckfield" destination blind give a clue to a later operator? I can remember this vehicle being advertised for sale in B&CP about ten years ago, wearing the same livery as in this photo’, so it’s been painted like this for quite a while. Thank you, Neville. I had an idea it wasn’t Hutchison’s livery. I’ll continue to list the operator as "Unknown" in my database unless or until someone can identify the livery . . .
I’ve been trawling through old copies of B&CP, and the ad appeared in several issues in 2010 (so not ten years ago!). At that time the vehicle was owned by Bob Hunt of Halesowen in the West Midlands. Thanks for these latest thoughts, Neville. She appears to reside in the vicinity of Sheffield Park (not Sheffield as the PSVC 2012 listing has her!) the home of the National Trust gardens and the Bluebell Railway. The vehicle is totally anonymous in respect of fleet name and legal lettering, though I have found a reference to Hutchison amid the notes on Wishaw, which says the firm, with its blue and cream buses, sold out to FIRST some years ago. It suggests, then, that this might in fact be the original livery. To clarify my comments on Hutchison’s livery, at the time that this vehicle was delivered their coach colour scheme was two-tone blue. Some vehicles did have cream window surrounds, but the dark and pale blue were the predominant colours. The plainer pale blue/cream livery came in after the time of this particular machine unless they kept it for much longer than was their usual practice. Does anybody have a shot of it when in service with Hutchison? FVA 462D is owned by Nick White of Sheffield (the Yorkshire town NOT Sheffield Park) as a preserved vehicle. There are numerous pics of it on Flickr including some recent ones of it with White’s fleet names, a personal livery applied by Mr White. How very interesting, John! So, what’s the UCKFIELD connection? A previous preservation owner Terry Smith lived at Uckfield, he sold it back to Bob Hunt 9/09 & it passed on again to White 8/10. The site appears to be down but the coach appears on another: https://sites.google.com/site/ It seems to be their only coach and possibly they run other wedding transport too. The point of the link I posted yesterday (but which won’t now come up) was that it showed the vehicle in what I presume was Hutchison colours – this was in response to Neville Mercer’s request for a shot of it when in service with Hutchison. Actually I think the shot showed it when it was Baird of Dunoon, but I’m pretty sure that it retained Hutchison livery. Re Hutchinsons Ford R192 FVA 462D. This is to my knowledge the only Ford R192 survivor with a Duple ‘Empress’ body. This is the same as a Bella Venture body as fitted on a Bedford VAM5 of which currently two roadworthy examples survive. Strange that ‘White Nostalgic Coaches’ web site is now no longer live. Strangely I can find no bus/coach company of that name registered in the Sheffield area on the Vehicle Operator/Licencing Service web site. Looks like it maybe being operated under another coach companies licence!